Property Size 1,610 sq. ft. This west end 3BR/3BA Hidden Dunes Gulfside condo sleeps 10 comfortably. The owners visit often and take meticulous care of their properties. This corner unit captures expansive gulf views of the beautiful emerald waters with floor to ceiling glass in the living area! Features include a newly remodeled kitchen with mosaic tile back splash, granite counters, stainless steel appliances, tile floors throughout, and premium electric shades in living and master. The master features a brand new king mattress with TV and DVD player. The second guest bedroom features two queen beds with TV/DVD and the third features a king bed with TV/DVD. There is also a queen sleeper sofa in living area. Gulfside amenities include a gulf front pool, hot tub, and fitness center. Hidden Dunes is a 27-acre gulf front paradise located entirely on the south side of Highway 98. 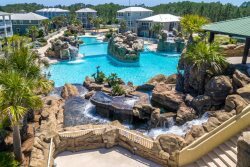 The resort offers six championship Rubico tennis courts, a professionally-staffed tennis facility with on-site USPTA professional, lighted basketball court, and approximately 500 feet of private beachfront with seasonal beach service. **Complimentary beach service will include 2 chairs and 1 umbrella during March-October.